The REVA Medical Fantom bioresorbable scaffold is available under CE Mark only and is not approved in the United States. The ISAR-STEREO-2 trial demonstrated the advantage of stents with thinner struts when they resulted in lower restenosis rates compared to stents with thicker struts.4 With thinner struts associated with better procedural and clinical results, bioresorbable scaffold development focused on reducing strut thickness. In the search for improvements in strength and biocompatibility, combined with radiopacity, a new bioresorbable polymer was specifically developed with scaffold applications in mind. This polymer is based on the tyrosine amino acid, which is bound with iodine for radiopacity and combined with short-chain polylactic acid for flexibility and ductility. This article summarizes the polymer design, as well as the mechanical and biological performance of this new polymer material in the coronary vasculature. A thorough search for bioresorbable materials was conducted to identify a polymer family appropriate for scaffold development. A group of materials based on the naturally occurring amino acid tyrosine and its derivatives developed at Rutgers University (New Jersey, USA) was selected. An extensive literature review and series of tests confirmed that these tyrosine-derived polycarbonates had the characteristics that would be important in the coronary scaffold application: appropriate mechanical properties, potential for radiopacity, biocompatible degradation and resorption profile, and compatibility with thermoprocessing for manufacturing. Development of a specific polymer for a coronary bioresorbable scaffold commenced with the design goals of radiopacity, strength, ductility, benign degradation with low lactic acid release, and storage stability. Multiple formulations were evaluated. The final polymer selected for coronary scaffolds is a copolymer of short-chain polylactic acid and tyrosine analogs, which are iodinated for visibility under standard fluoroscopy. This polymer is manufactured by REVA Medical (San Diego, California, USA) under the trade name Tyrocore™ and is used to make REVA’s Fantom® bioresorbable scaffold. Tyrocore is composed of analogs of the amino acid tyrosine (desaminotyrosine) and biocompatible hydroxy esters. It consists of an iodinated diphenol and a low-molecular-weight oligomer of polylactic acid diol (Figure 1), in an 8:1 ratio, respectively. The properties of Tyrocore and poly-L-lactic acid (PLLA), as previously published,5 are shown in Table 1. The phenyl ring of the iodinated diphenol is an inherently strong molecular structure, which contributes to Tyrocore’s high tensile strength. The capability to retain ductility, while maintaining strength, is directly associated with Tyrocore’s unique composition and high molecular weight. Tyrocore’s radiopacity results from the iodine, which is covalently bonded to the tyrosine analog to create the iodinated diphenol. Figure 1. Molecular structure of Tyrocore components: iodinated diphenol (A) and polylactic acid diol (B). Figure 2. Laser-cutting of Fantom from a Tyrocore tube. The Fantom device is a Tyrocore bioresorbable scaffold (T-BRS). The process begins when the iodinated diphenol and polylactic acid diol monomers are combined in a polymerization reaction. The resulting Tyrocore polymer is then formed into a tube. Once the tubes are formed to the desired diameter, they are laser cut to achieve the final scaffold design (Figure 2). The laser-cut scaffolds are coated with a mixture of Tyrocore and sirolimus, resulting in a drug dose of 1.97 µg/mm2, which is equivalent to a 115 µg dose on a 3.0 x 18 mm scaffold; > 60% of the drug is eluted within the first 30 days. The coated scaffold is crimped onto a rapid-exchange balloon catheter with a semicompliant balloon. The nominal pressure for all sizes of the Fantom device is 7 atm with a balloon-rated burst pressure of 18 atm. Fantom is coated with the same Tyrocore polymer as the scaffold; therefore, there is no discernible coating layer. The result is an integrated coating with the same mechanical properties, degradation, and resorption profile as the underlying scaffold. This differs substantially from first-generation PLA and magnesium alloy scaffolds, which are coated with a distinct drug-containing polymer that is not the same as the underlying scaffold material. Figure 3. Radiopacity of the Fantom bioresorbable scaffold (A) compared to the Absorb bioresorbable scaffold (B). Fantom gets its radiopacity from the iodinated diphenol in Tyrocore. Due to their high mass, iodine atoms scatter x-rays and impart radiopacity, allowing Fantom to be visualized using standard angiographic techniques (Figure 3). The visibility allows for accurate scaffold placement and expansion, which reduces the risk of geographic miss and malapposition. The amount of iodine in a Fantom scaffold is < 1% of the iodine found in 1 mL of contrast media. Tyrocore’s high tensile strength enables Fantom to have thin struts (125 µm) while improving strength and reducing recoil compared to first-generation bioresorbable scaffolds with strut thickness ≥ 150 µm (Table 2).6 Thin struts are one of the most important technical improvements in bioresorbable scaffolds owing to their effect on improving outcomes and procedural performance. High radial strength and low recoil are important to ensure complete apposition of the scaffold during implantation, as well as to provide structural support to the vessel during healing. Figure 4. 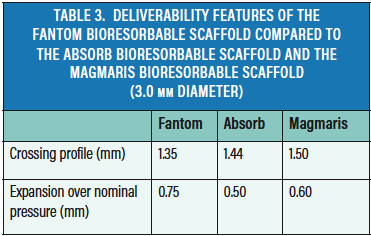 Deployment procedure of the Fantom bioresorbable scaffold compared to the Absorb bioresorbable scaffold. Tyrocore degrades through a bulk erosion process. Once in the body, water enters the scaffold and breaks the molecular bonds in the polymer. This hydrolysis reaction occurs evenly throughout the entire structure of the scaffold, which differs from the surface-based corrosion reaction associated with degradation of magnesium alloy–based scaffolds. Once the polymer is degraded into individual monomers, the resorption process begins. The final degradants of Tyrocore are the iodinated tyrosine analog, carbon dioxide, and water. Radiolabeled studies have shown that the iodinated tyrosine analog is safely excreted from the body. Figure 5. Radial strength of the Fantom bioresorbable scaffold during degradation. Tyrocore degradation takes approximately 1 year for the polymer to lose 80% of its molecular weight. 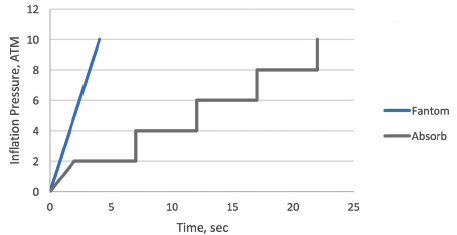 Figure 5 shows the radial strength of the scaffold during degradation as measured in vitro. During the first month following implantation, polymer hydration results in an increase in radial strength. 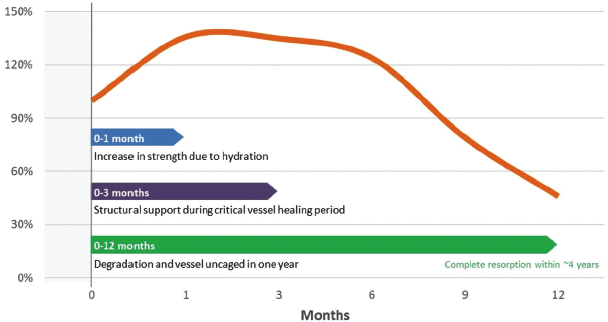 Structural support is sustained at this level during the critical 3-month vessel healing period. By 12 months, the scaffold is no longer providing structural support to the vessel, although the material is still present and visible using fluoroscopy or intravascular imaging. Complete resorption of the Tyrocore polymer takes approximately 4 years. During this time, mass loss occurs as the polymer degradants are cleared from the vessel and body, resulting in reduced radiopacity of the scaffold over time. Figure 6. Lactic acid concentration in the arterial wall during degradation and resorption of the Fantom bioresorbable scaffold compared to the Absorb bioresorbable scaffold based on a computational model. Computer modeling, animal studies, and clinical studies were used to investigate the characteristics that may contribute to late scaffold events observed with P-BRS and compare them to T-BRS. To study the time course of PLA degradation for both P-BRS and T-BRS, a computational model was developed that is capable of predicting lactic acid accumulation in local arterial tissue from 0 to 42 months following implantation in the coronary arteries (Figure 6). The P-BRS is represented by the Absorb bioresorbable vascular scaffold system (Abbott Vascular) based on a previously published analysis,10 which was modified to account for its two-step degradation of the coating followed by the scaffold. The model predicts two peaks of lactic acid tissue concentration for Absorb. The first, between 0 and 6 months, is associated with degradation of the PLA-based drug and polymer coating. The second, larger peak falls between 18 and 42 months and is associated with PLA scaffold degradation. For Fantom, there is no coating-related early peak because the Tyrocore-based drug and polymer coating integrates into the Tyrocore scaffold without creating a separate layer. A very low and broad peak of lactic acid tissue concentration around 28 months is associated with the Tyrocore scaffold resorption. 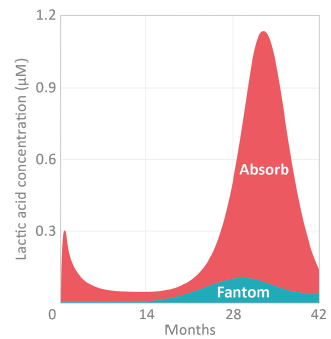 The maximum lactic acid tissue concentration for Fantom is two orders of magnitude lower than for Absorb. The difference in late-stage lactic acid release likely results from the lesser amount and substantially shorter segment polylactic acid diol (< 10,000 Da) contained in Tyrocore compared to the high-molecular-weight PLLA (> 100,000 Da) in Absorb. The short-chain segment polylactic acid diol in Tyrocore can break down quicker and over a sufficiently longer time to better match the elimination of lactic acid by natural biologic processes, whereby lactic acid does not accumulate in the arterial wall. Figure 7. 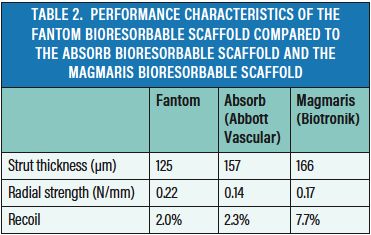 Biocompatibility analysis of the Fantom bioresorbable scaffold compared to the Absorb bioresorbable scaffold. 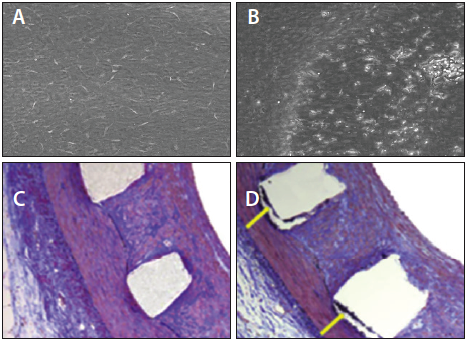 Three-month endothelialization in a rabbit artery using the Fantom (A) and Absorb (B) devices. Six-month degradation in a porcine artery using the Fantom (C) and Absorb (D) devices. The effect of early stage lactic acid release from polymer degradation can be observed in animal studies. During this time, the antiproliferative drug elutes from the scaffold, and in the case of P-BRS, the PLA-based polymer coating completely degrades. The difference in tissue response between T-BRS and P-BRS can be seen in a direct comparison of the Fantom and Absorb devices. Endothelialization of the Fantom scaffold was significantly better than Absorb at 3 months after implantation in a rabbit artery model (Figure 7). Additionally, increased irritation exists for Absorb compared to Fantom as evidenced by the presence of calcium at the interface between the tissue and scaffold struts in a porcine artery at 6 months (Figure 7). Figure 8. OCT healing analysis of the Fantom bioresorbable scaffold. Matched images from the FANTOM II study of Fantom at baseline (A), at 6 months (B), and at 24 months (C). Figure 9. Results from the FANTOM II OCT healing analysis showing strut coverage at 6 months and 24 months (n = 25). The properties and biocompatibility of this radiopaque, tyrosine-derived polymer compare favorably to PLA polymers for use in the coronary scaffold application. To achieve these properties, a new polymer family of tyrosine-derived polymers was identified, and the unique Tyrocore polymer was developed. This enables a bioresorbable scaffold with thin struts, high radial strength, and radiopacity. Additionally, the Tyrocore-based Fantom bioresorbable scaffold has demonstrated biocompatibility in preclinical and clinical studies. These attributes contribute to improved ease-of-use during the implantation procedure and enhanced vessel healing. Complete scaffold healing into the vessel wall ensures that the scaffold is secure during the degradation and resorption process. The long-term goal is complete resorption and absence of a permanent implant in order to reduce long-term adverse events and restore natural vessel function. 1. Abizaid A, Carrié D, Frey N, et al. 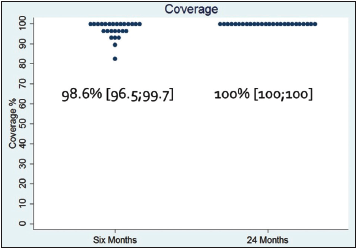 6-month clinical and angiographic outcomes of a novel radiopaque sirolimus-eluting bioresorbable vascular scaffold: the FANTOM II study. JACC Cardiovasc Interv. 2017;10:1832-1838. 2. Bouchi YH, Gogas BD. Biocorrodible metals for coronary revascularization: lessons from PROGRESS-AMS, BIOSOLVE-I, and BIOSOLVE-II. Glob Cardiol Sci Pract. 2015;2015:63. 3. Bossard M, Eswaran S, Kumaran K, et al. High rates of target lesion failure with a novel magnesium-based, sirolimus-eluting BRS: insights from an all-comer, multicenter registry. Presented at: EuroPCR 2018; May 22–25, 2018; Paris, France. 4. Pache J, Kastrati A, Mehilli J, et al. Intracoronary stenting and angiographic results: strut thickness effect on restenosis outcome (ISAR-STEREO-2) trial. J Am Coll Cardiol. 2003;41:1283-1288. 5. Auras R, Lim L, Selke S, Tsuji H, ed. Poly(Lactic acid): synthesis, structure, properties, processing, and applications. Hoboken, New Jersey: John Wiley & Sons, Inc.; 2010. 6. Leibundgut G. Tyrocore: a proprietary polymer uniquely designed for vascular scaffolds. Presented at: EuroPCR 2018; May 22–25, 2018; Paris, France. 7. Ormiston, J. New BRS platforms. Presented at: EBC Rotterdam 2016; October 14–15, 2016; Rotterdam, the Netherlands. 8. Magmaris. www.magmaris.com/en/product-details, 2017. Accessed on July 25, 2018. 9. Absorb [package insert]. Abbott Park, IL: Abbott Laboratories; 2017. 10. Otsuka F, Pacheco E, Perkins LE, et al. Long-term safety of an everolimus-eluting bioresorbable vascular scaffold and the cobalt-chromium XIENCE V stent in a porcine coronary artery model. Circ Cardiovasc Interv. 2014;7:330-342. 11. Holm NR. REVA FANTOM II performance and healing patterns by OCT two-year serial follow-up. Presented at: EuroPCR 2018; May 22–25, 2018; Paris, France. Disclosures: Medical user advisory board member for REVA Medical; relationships with drug and device companies including Terumo, Acrostak, Biosensors, Boston Scientific Corporation, Abbott Vascular, and Impuls Medical.